Let the establishment – in this case the New York Times – allow to be uttered just a single peep against modern architecture and its enforcers suffer total meltdown of equanimity. Aaron Betsky, the architecture critic for the journal of the American Institute of Architects, has gone ballistic in his reply, in Architecture magazine, to the recent essay on the Times’s oped page by Steven Bingler and Martin Pedersen, headlined “How to Rebuild Architecture,” which merely opines that architects should try listening to the public, the ultimate users of architecture. 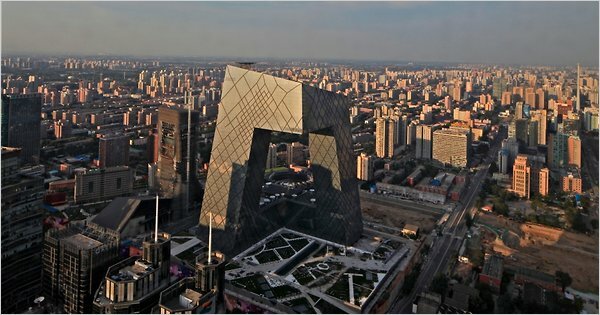 That tower building in Beijing is actually known as 大裤衩 “Big Underpants”. Yes, designed by Rem Koolhaas. Also just “Big Pants.” I think those names were invented by Chinese propaganda officials hoping that they can prevent the masses from embracing my nickname for it – the “Stomp the People Building.” That’s what it looks like it is doing.